-Great for film, television, commercials... anything to suit your needs. -Full time staff M-F to meet your production needs. -Multiple additional shooting spaces available soon! 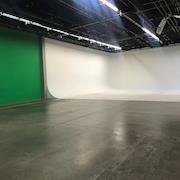 CineFocus offers two state-of-the-art Soundstages for multiple production uses including commercial filming, celebrities, broadcast, and TV Shows, entertainment, music videos, product and table-top, and photography. Stage A has 4100sq/ft and Stage B has 3100sq/ft of total space available. Our studio also provides pre-built sets which can be styled to your needs. These sets feature a hospital scenario and doctor’s office, a kitchen, and an office. Our amenities include several bathrooms on each stage, showers, a kitchen, wardrobe/make-up/hair and production rooms. Crew and talent will appreciate stage entry from private parking lots. We also offer to rent the newest professional Digital Film Cameras such as the ARRI LF camera kit together with six Signature Prime lenses or the RED Helium 8k camera kit. All gear can be brought onto the stage without a Corkage Fee. Our staff is attentive and friendly and will make sure you have a successful production from start to wrap. Furthermore, Cinefocus offers a complete editing bay and an in-house editor who can start working on your project right away while you are shooting! We have been in the industry since 2017.